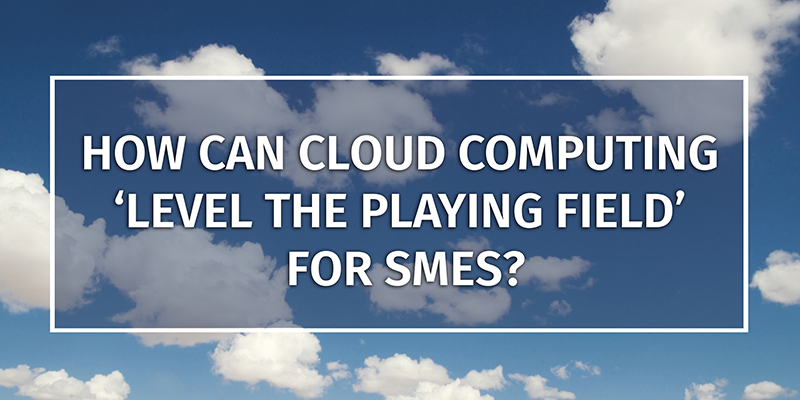 How can Cloud computing ‘level the playing field’ for SMEs? As technology continues to evolve, the competitive business landscape is changing. Traditionally, large organisations have dominated with the advantage of the available funds and resources to purchase and maintain the latest enterprise-grade software and IT infrastructure. Small and Medium Enterprises (SMEs) were unable to utilise the same technology, severely limiting their growth and ability to be competitive. Now, the introduction of Cloud computing has disrupted the traditional way of working. SMEs can access the same cutting edge technology as larger businesses, enabling them to grow faster, strengthen their business performance and stay ahead of the competition, with minimal investment. What are the benefits of Cloud computing for SMEs? Moving to the Cloud allows SMEs to maximise their return on investment, helping them to remain agile when it comes to implementing new technologies in a fast-paced, ever changing business environment. SMEs typically require sign off from fewer people/departments resulting in much faster decision making than their larger competitors. With no upfront costs or lengthy installation processes, SMEs can easily trial a Cloud based app and see if it’s right for their business. If not, they can try something different without wasting lots of time and money in the process. As Steve Garnett, European director at Salesforce.com comments, ‘With Cloud lowering the barriers to innovation, small and medium-sized enterprises (SMEs) are starting to pose a bigger threat to the business prospects of larger enterprises than ever before’. With the range of applications available in the cloud continuing to grow, the SMEs who are brave enough to ‘take the plunge’ and adopt new Cloud technology will reap the benefits and stay ahead of the competition. If you would like to find out more about how the Cloud can work for your business, speak to Jack Wright on 01285 810606 or email jack.wright@yourdms.net.